For the first time since 1941, the 1946 baseball season opened with the United States at peace. Fans, who had endured subpar baseball for the previous three years would turn out in record numbers this season. In Brooklyn, the Dodgers would shatter their previous attendance record, drawing just under 1.8 million. An early indication of what was to come was the near-capacity crowd of 26,787 that showed up at Ebbets Field on April 23 for a Tuesday afternoon game against the Boston Braves. Weekday afternoon games, particularly in the spring, were typically not well attended. But the Dodgers had gotten off to a 5-1 start and pennant fever was already being felt in Brooklyn. On the mound for the Dodgers was Ed Head, a 28-year-old right-hander, who was making his first major-league appearance since 1944. After two years in the Army’s Tank Destroyer Corps at Fort Hood, Texas, he had made the team out of spring training, though his arm was still sore from absorbing the recoil from a 57-millimeter antitank gun. That Head had ever made it to the major leagues was a miracle in itself. In 1935, when he was 17, Head was a left-handed pitcher for a semipro team in Louisiana. One afternoon he was on a bus for scheduled game against another team. He and his girlfriend, who accompanied him, were seated on the left side of the bus; Head in the aisle seat and the girl in the window seat. As teenage boys typically do, Head had his left arm draped over her shoulders. Unfortunately, they were seated almost directly in the path of another bus that rammed theirs. Head was knocked unconscious. When he awoke, he saw his girlfriend was dead and his left arm, wrenched loose from its socket, was “a mass of shattered bone and mangled flesh.”1 The local doctor told him he would have to amputate the arm. Head argued against amputation and pleaded to have his uncle, who had the only fluoroscope in the area, to come look at the injury. His uncle, a doctor, determined that he could save the arm, which he did following many hours of surgery. For several days Head’s life had been in danger and the thought of his ever pitching again had been dismissed. His lifetime goal had always been to be a major-league pitcher, but with his left arm nearly useless, that would be impossible. At that point, Head realized there was only one way he could reach his goal, by throwing right-handed. The dedication and effort needed to make this happen would have discouraged most people, but Head worked and practiced until he succeeded. The day before Head’s return to baseball, his wife, Johnnie Mae, had given birth to their second son, whom they named Rickey. So before he took the mound, he was handing out cigars in the clubhouse. When he did take the mound, he pitched the game of his career, a 5-0 no-hitter. Head had flirted with a no-hitter once before. On May 29, 1942, he retired the first 18 New York Giants before walking Bill Werber, ending the possibility of a perfect game. 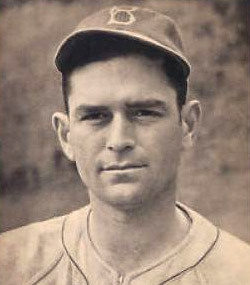 The no-hitter ended when Harry Danning led off the eighth inning with a single. Head was not overpowering this afternoon, striking out only two, but he used an assortment of fastballs, curveballs, sliders, and changeups to keep the opposing batters off stride. The Braves had only four baserunners, three walks, and a fifth-inning error by shortstop Pee Wee Reese, while Brooklyn’s defense turned two double plays. Reese’s error was clearly a bobble, with no controversy on the scoring. The Dodgers used four straight hits to take a two-run lead in the third inning. They added two more in the fifth on a two-run double by Ed Stevens. Ferrell Anderson’s solo home run in the sixth accounted for Brooklyn’s fifth run. Meanwhile, Head kept getting easy outs. He had only two close calls, one in the seventh inning and one in the eighth. Tommy Holmes led off the seventh with a long drive to right center field that rookie center fielder Carl Furillo ran down and caught in front of the exit gate. In the eighth Whitey Wietelmann slashed a line drive between Reese and third baseman Pete Reiser that Reiser was able to grab with his glove hand. This was a knowledgeable crowd, aware of what was happening. They were silent when Chuck Workman, batting for Boston pitcher Mort Cooper, led off the ninth with a walk. But they rose in joy when, as Connie Ryan was striking out, catcher Ferrell Anderson threw to first baseman Stevens to double up Workman. Johnny Hopp made the final out on a groundball to second baseman Billy Herman as the crowd erupted in cheers. In true baseball tradition, none of the other Dodgers mentioned to Head that he was throwing a no-hitter. Herman said he hadn’t realized it until the later innings when the crown began loudly cheering every putout. Reese and Stevens claimed they first learned about it when they reached the dressing room. Head’s no hitter was the first by a Dodger since Tex Carleton’s at Cincinnati on April 30, 1940. It was the first in Brooklyn since June 15, 1938, when Johnny Vander Meer of the Reds pitched his second consecutive no-hitter in the first night game at Ebbets Field. A few weeks after the no-hitter, Head reinjured his arm, ending his major-league career. 1 Tom Meany, “Fluoroscope Helped to Avoid Amputation; Youth, Now a Dodger, Then Learned to Throw With Other Hand,” PM, April 30, 1942. 2 Joseph M. Sheehan, “Head Of Dodgers Wins No-Hitter, 5-0,” New York Times, April 24, 1946.